The buck stopped here. 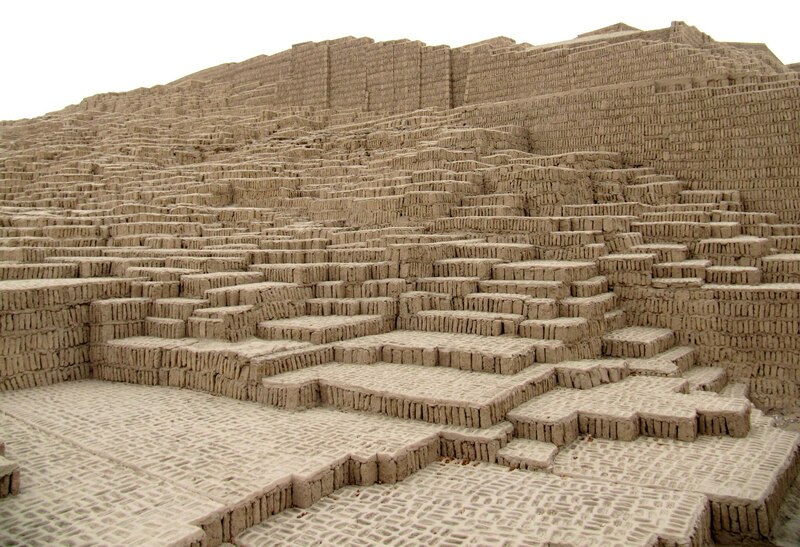 Our last stop in South America was Lima. 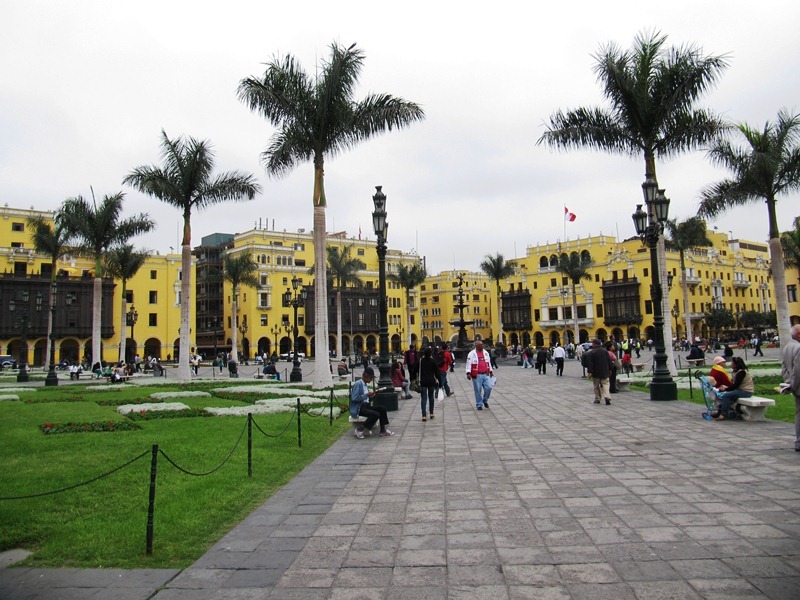 We had intended to spend more time in Peru’s capitol city, but the way things worked out we got about a day and a half. So we tried to make the most of it. It was kind of fun to finish off our trip with final rush of food and fun. Our first stop after dropping off our packs at the hostel was more ceviche! 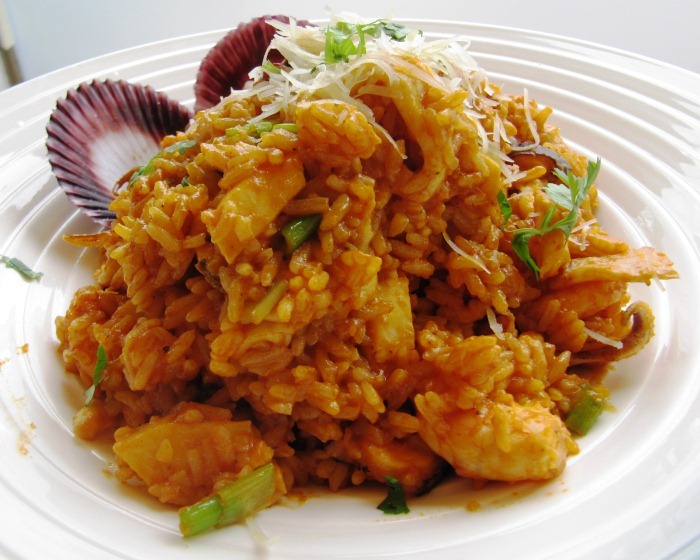 We went to a convivial restaurant called Pontal Azul in the Miraflores neighborhood. Lima is right on the ocean and this, combined with the modern amenities of the neighborhood, made us feel like we were in California again. 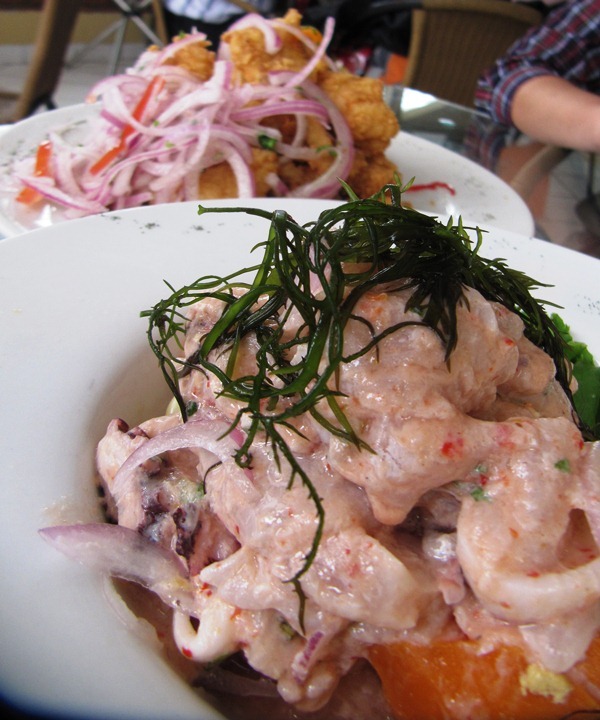 Its coastal location also makes for supremely fresh seafood, and this ceviche didn’t disappoint. Next we visited a small set of ruins nearby. The Inca get most of the attention from the west since they were the ones in power when the Spanish came. But in fact that empire was only a few hundred years old and many civilizations existed before them. A series of these previous groups were responsible for this slightly strange set of ruins, which is essentially a large hill built of stacked bricks. It took several hundred years to build with each society adding layers upon layers. The next day we went straight to downtown. 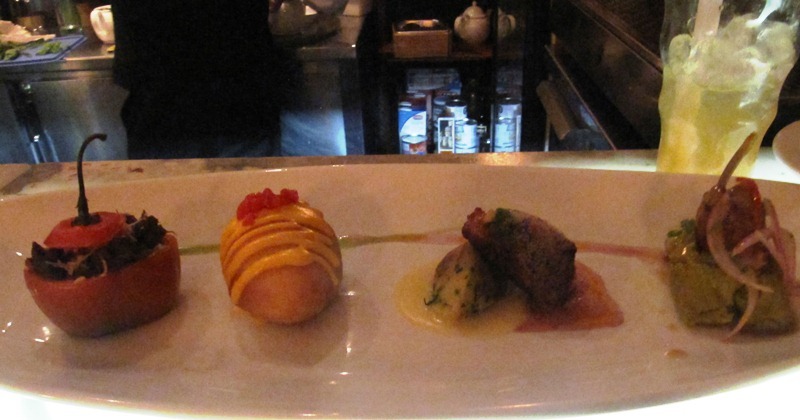 Our first stop was Tanta, a restaurant owned by Peru’s star chef, Gastón Acurio. We weren’t planning to go here but we accidently missed the breakfast at our hostel. This turned out to be a very good mistake. 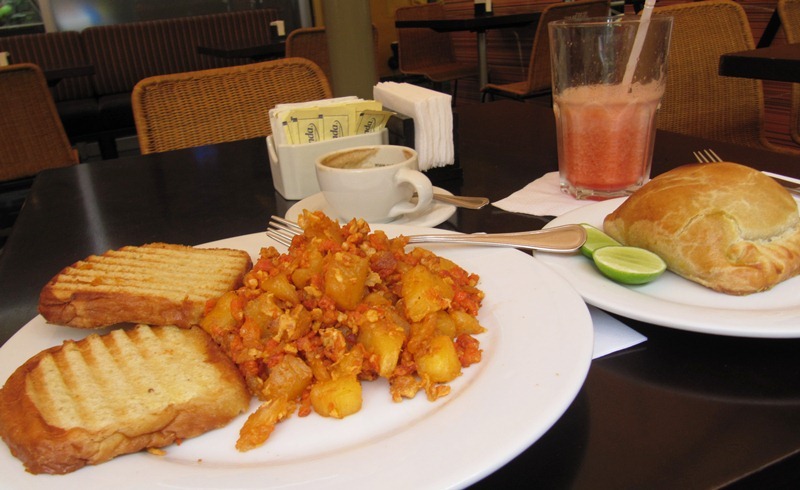 I ordered eggs scrambled with fried yucca and chorizo along with some coffee mixed with honey. It was to die for. My mouth is watering just thinking about it. I love fried yucca. Its starchiness was perfectly balanced by the spicy oil in the chorizo. Nathan, meanwhile, had an an empanada stuffed with aji de gallina, a kind of chicken stew made creamy nut-based sauce. He accompanied this with an excellent strawberry and passionfruit smoothie. I would definitely go back. We spent the next couple hours exploring the old center. We visited a monestary with a crypt full to the brim of old bones. They estimated the remains of 50,000 people were kept there. 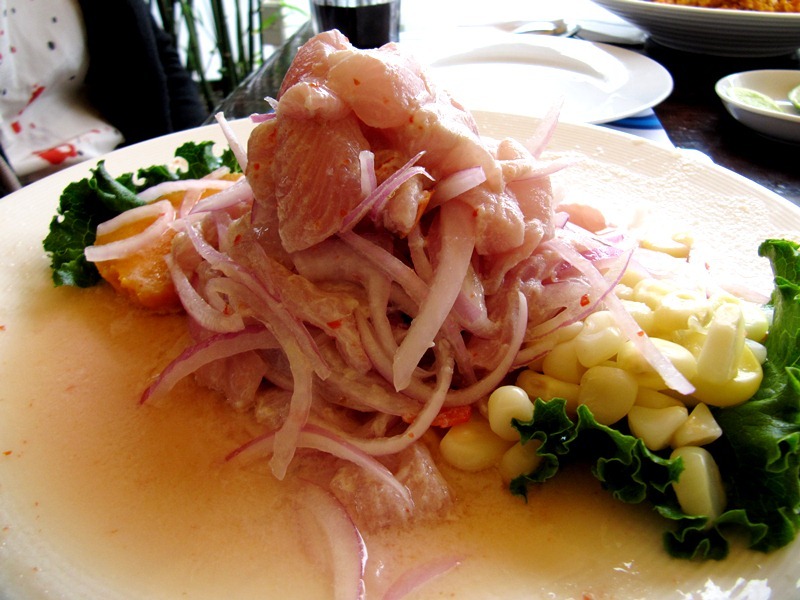 Afterwards we snuck in some more ceviche at La Choza Nautica, which was good but not as good as Pontal Azul. We then hurried back to Miraflores for a sunset beach stroll before meeting our friends Brenda and Drew for dinner. Based on the excellent experience at Tanta, we decided to eat at Gaston’s other restaurant, Astrid y Gaston. It was a fight to get a seat, but we finally managed to eat at the bar around 10pm. The verdict – it was ok. The food was well executed but, as Nathan put it, it lacked love. Too bad. Ready? We are ready for more traveling, it’s the settling down that is the hard part. Thanks for writing its been entertaining for all of us. Ending? The trip is not ending… There is plenty more to come, US adventures, camping trips, Europe, India and Southeast Asia. Destination world here we come! That’s great news. Keep traveling and writing; we’ll keep reading!